The LZ 129 Hindenburg was a large German airship, built in 1936. It was named in honor of the German field marshal and statesman Paul von Hindenburg. Such airships are called Zeppelin. Along with another Zeppelin, LZ 130 Graf Zeppelin, it was the biggest airship in the world at the time it was built. The Zeppelin gained lots of publicity and became very famous. The boxer Max Schmeling flew on it back to Germany after defeating Joe Louis in the United States. It was also present during the opening ceremony of the 1936 Summer Olympics which were held in Berlin. This attention was part of the Zeppelin company's plan to offer a fleet of their airships for trans-atlantic service. 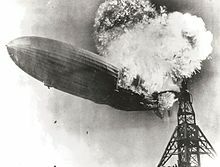 On May 6, 1937, the Hindenburg was landing in New Jersey after a transatlantic flight, when it burst into flames. 36 people died and many were injured. Many people think it did this because it was filled with a gas called hydrogen, which can catch on fire easily. An announcer, Herbert Morrison reported the landing and then screamed and said, "Oh the humanity" after it caught on fire. Morrison's line is now famous around the world as well as photos and film footage of the disaster. The rock group Led Zeppelin used a picture of the fire for the cover of their self-titled debut album. This page was last changed on 25 August 2018, at 05:38.